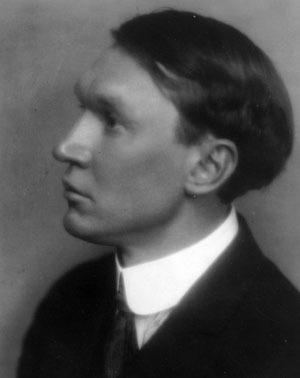 Vachel Lindsay (Author) Note: This poem, particularly the third section, was suggested by an allusion in a sermon by my pastor, F. W. Burnham, to the heroic life and death of Ray Eldred. Eldred was a missionary of the Disciples of Christ who perished while swimming a treacherous branch of the Congo. See "A Master Builder on the Congo", by Andrew F. Hensey, published by Fleming H. Revell. Poetry Atlas note: This poem is controversial. The Poetry Atlas researcher sought it out because of the unforgettable chanted chorus lines above, remembered from childhood. Unfortunately it turns out that the poem as a whole has been much criticised as racist. And certainly it does seem to reflect racist attitudes prevalent at the time. Our current position is that we have decided not to make the entire poem available. In his defense, there is no evidence of racisim associated with Vachel Lindsay anywhere else. Indeed contemporaries regarded Lindsay as a supporter of African-Americans. Vachel Lindsay could point to his discovery and promotion of the African-American Poet Langston Hughes and his authorship of the poem "The Jazz-Birds" drawing attention to the widely ignored contribution of African Americans in World War I.